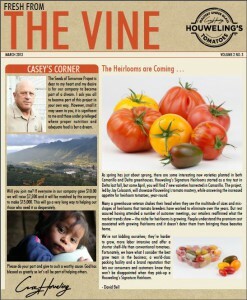 Just over a year ago we started an initiative at our company called “THE VINE”. It’s a newsletter that we publish monthly in English and Spanish that provides the more than 750 employees at our two greenhouse farms updates from various departments. I believe it is important to ensure everyone in the company whether they are one of our dedicated workers tending to the vines, or the hard working people processing invoices, packing orders, selling our products etc, have an idea of what is going on outside of their individual roles/departments. Often, suppliers and visitors to the farms see these newsletters and comment to me how much they enjoy reading them. To be honest I was kind of surprised, but nonetheless it made me realize that perhaps other fans and friends of Houweling’s would be interested to read our newsletter. Keep in mind, when deciding to publish The Vine on our website, I didn’t want it to change the original intent. So not all of the content may be interesting to you, but certainly it will give you a better picture of who we are as a company. Click the hyper links to view the ENGLISH or SPANISH version. 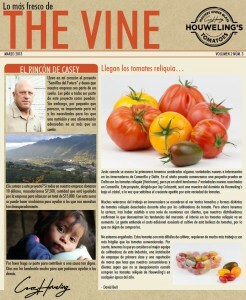 This entry was posted in Business, Culture, Newsletter and tagged Craftsman's Care, fundraise, Greenhouse, Guatemala, Heirlooms, Impact Ministries, Philanthropy, Seeds of Tomorrow, The Vine. Bookmark the permalink. Comments are closed, but you can leave a trackback: Trackback URL.